Like many women, Andrea Owen always lived life on the sidelines, watching each day pass by without ever catching a glimpse of the happiness she yearned for-until the day she had enough. She realized that she had to take action and step out of the box she had created for herself if she really wanted the best life possible. And now, as a celebrated life coach, she shows thousands of women how to take the reins, create an actionable plan for their goals, and finally reach their full potential. 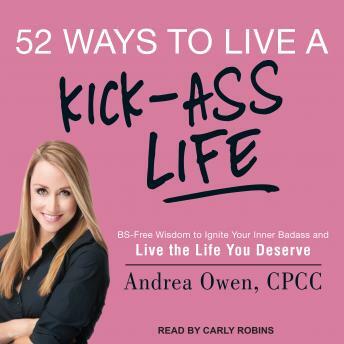 In this powerful book, Owen guides you through her acclaimed strategies for creating a more fulfilling life. Each goal-orientated lesson empowers you to take control of the barriers that keep you from achieving the love and success you desire. From breaking the unrewarding cycle of people pleasing to dealing with unsupportive friends, this book approaches the problems you face with a candid look at why you aren't satisfied-and how to fix it. Owen's life-changing wisdom helps you uncover your self-limiting beliefs as well as push you out of your comfort zone by zeroing in on the most difficult issues.